Scott Burka of Nashville, who aged out with the Bluecoats last summer, submitted this tale: "I came in on baritone but with 90 or more other people also trying out on baritone, I was forced to choose between being a possible alternate or trying to pick up the contra as my new instrument. So I took the offer from the staff to give playing contra a try and it all worked out for me! Yeah, it could be heavy sometimes, but it was worth every bit of soreness I experienced in the end. "To anyone auditioning for a corps for the first time this coming season, my advice to you would be to practice as much as possible, don't cut yourself (if you are invited to come back to the next camp- do it even if you think you have no chance), and be flexible because good things can happen if you want it bad enough. 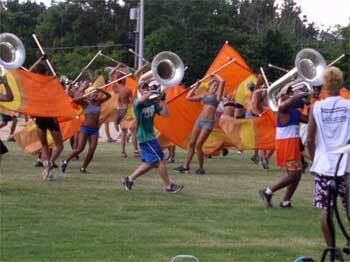 "This picture was taken on the last day of practice in Orlando. We got an awesome housing site (air-conditioned gym, lots of nice showers, several decent fields) and when it wasn't raining -- all of about three hours a day -- we were working hard to put the finishing touches on our show. My family came for the practice and took some pictures and this one seems to really "capture" the excitement of the end of our show, as well as the anticipation of the big night ahead of us and the end of a great season. I'm the one in the middle with the green shirt." Thanks Scott!